Size of Male: 35-45 lbs., 10 in. Size of Female: 35-35 lbs., 10 in. Famed for their loyalty and devotion, the Skye Terrier is a long, elegant dog who is deceptively tough and strong. The Skye is one of the oldest of all the terrier breeds, known in the west of Scotland for several hundred years, where they have been used to hunt fox, badger and otter. The Skye is fearless, good-tempered, “canny,” and fiercely loyal to his loved ones. These medium-sized terriers make great family companions but they are one of the most endangered of all breeds. The Skye Terrier comes from the west of Scotland and the island of Skye. According to one story, this terrier breed came into being in the 1600s when a ship bearing some Maltese toy dogs shipwrecked on the Isle of Skye. These little dogs, with their long coats, were bred with the local terriers to produce the Skye. 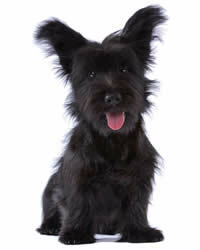 However, John Caius, writing in 1572, describes dogs like the Skye Terrier already in the west of Scotland. Instead, it may be true that the breed is the result of crosses between the local terrier population and Corgis or Swedish Vallhunds left behind in the south by the Vikings. No one really knows. It’s all speculation. What is true is that this terrier breed was a very popular and efficient dog on the farm in the west of Scotland and was used to hunt and kill foxes, badgers, otters and other vermin. In the 19th century Queen Victoria became a patroness of the breed and they were very popular with the nobility. The most famous of these dogs was Greyfriar’s Bobby. Bobby’s owner, Constable John Grey, died when Bobby was two years old. For the next 14 years Bobby would not leave his master’s grave in Edinburgh, showing the devotion of the breed. People brought the dog food and he maintained his vigil at the gravesite. After the dog finally died, when he was 16, a statue was erected of him which still stands today. Skye Terriers are known for being loving, affectionate dogs and very devoted to their owners. They are good-natured and loyal. They are typically brave, bold dogs, playful and happy and they love attention. However, they are very much a terrier breed and they have plenty of independence at times. They can be willful on occasion and, if their owner isn’t clearly in charge, these dogs will take over. These dogs usually get along all right with other dogs but they may be inclined to chase and kill other small pets unless they are well-socialized from a young age. Skyes usually love children. They are usually protective of their home and will bark to give a warning. These dogs are generally cautious with strangers. They make an excellent pet but they are one of the rarest breeds, so finding one is not always easy. Living Environment – This small dog breed makes a very good apartment dog. They are small and they have moderate exercise needs. They will also do well with a small yard of their own. They do not do well as kennel dogs. Grooming – In the grooming department, these dogs need to be brushed two to three times per weeks to prevent mats from forming. They are not clipped. You may need to trim the bottom of their coat to keep it from dragging the ground. Trim the hair around the paws to keep the dogs from tracking in mud and dirt. Bathe as needed. They are average shedders. Diet & Exercise – Dietary requirements are considered normal. These dogs do need moderate daily exercise. They will enjoy a long walk or running off-leash in a safe, enclosed area. Health – In the health department, this is a relatively healthy breed, but they are achondroplastic, meaning they are a dwarf breed with very short legs, like the Corgis. They can have “Skye limp” or puppy limp due to the premature closure of the distal radial growth plate. Be very careful with how much you allow your puppy to exercise at a young age and do not allow him or her to over-do things such as jumping, leaping or running excessively. Wait until after the growth plate is closed at 8-10 months before you allow your puppy to play more roughly. Degenerative disc disease can be a problem with short-legged dogs. Mammary cancer can occur in the breed, as can hemangiosarcoma, autoimmune problems, and canine hyperthyroidism. Some of these issues may occur very infrequently. If you are interested in this dog breed you should talk to a breeder about possible dog health problems. The Skye Terrier can be a sensitive dog but he is not submissive. He often has a mind of his own. It’s always best to win his confidence and respect; you need to try to earn their love. If this dog loves and respects you, then dog training can become quite fun. You should never use harsh methods with this breed. Instead, use positive dog training methods. Stay upbeat and cheerful with your training and be creative if necessary. The more enjoyable you make training, the more your dog will enjoy learning. These dogs can do very well in agility, tracking and other dog activities if you find ways to motivate them.